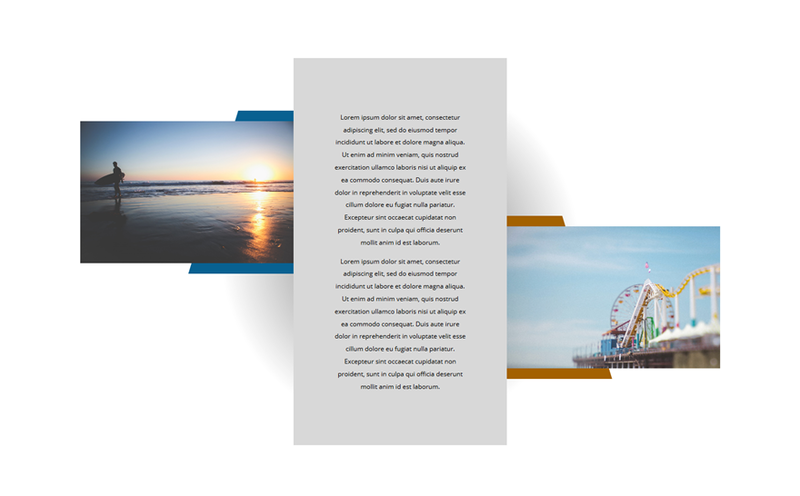 The new Divi options offer tons of possibilities. Modules, rows and columns, more than ever, empower one another on the road towards stunning and user-friendly web design. 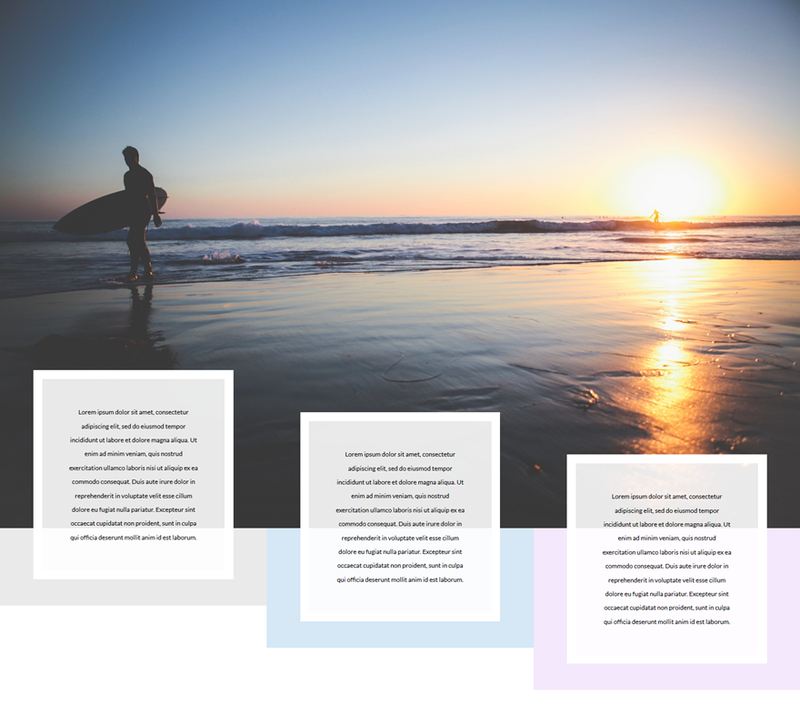 One of the things it can do is create remarkable editorial style sections. 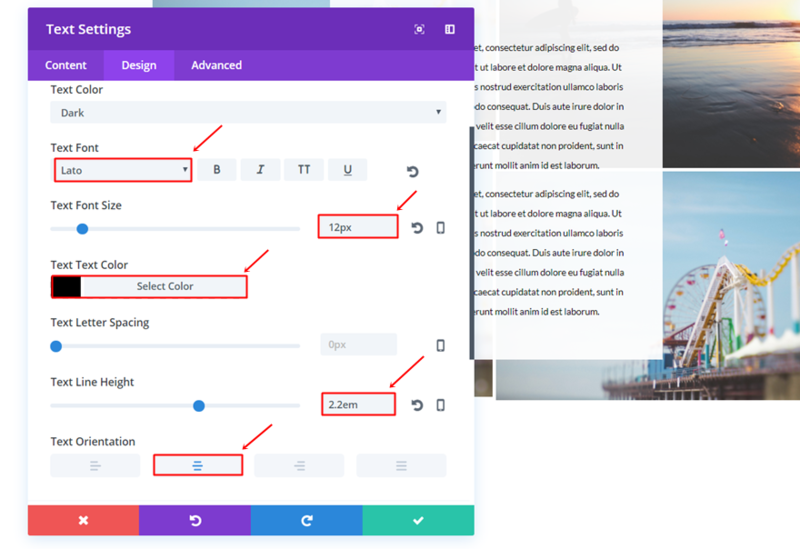 And that’s exactly what we’ll be showing you in this post; 5 different editorial style section layouts that you can use within different websites. The best part? 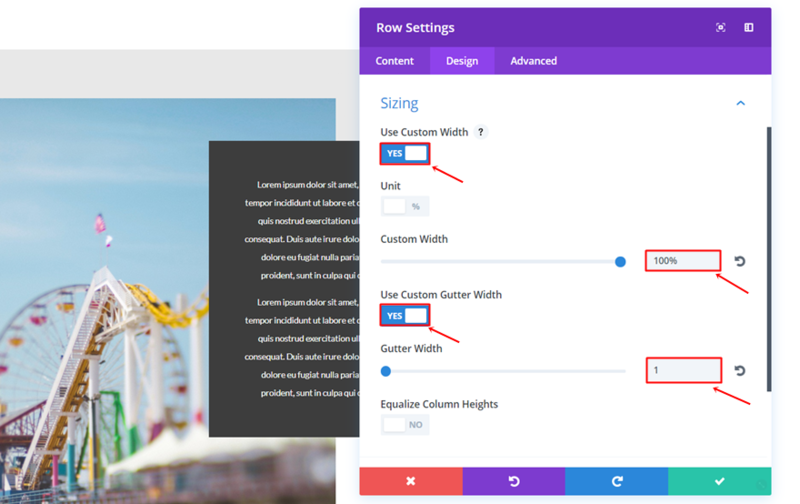 The post is made by using the right settings for each module, row and column only. 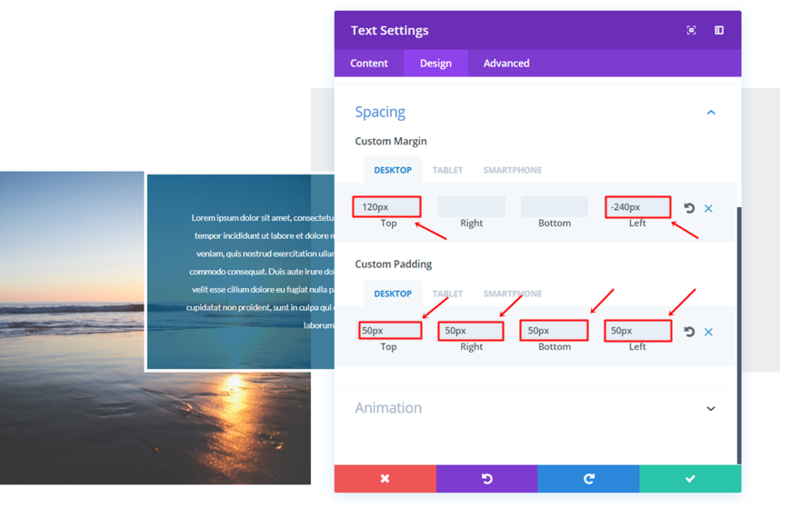 Let’s take a look at the five examples we’ll show you how to create. 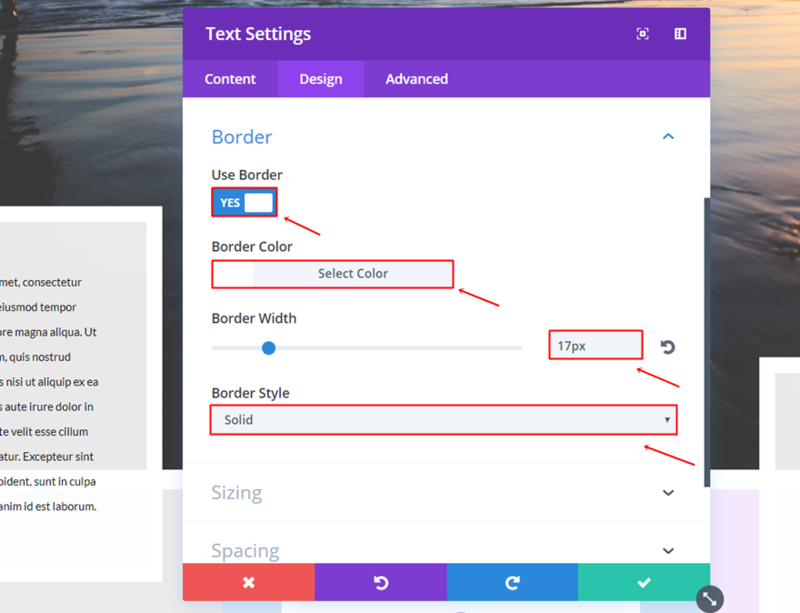 Let’s get started by creating our first editor style layout. 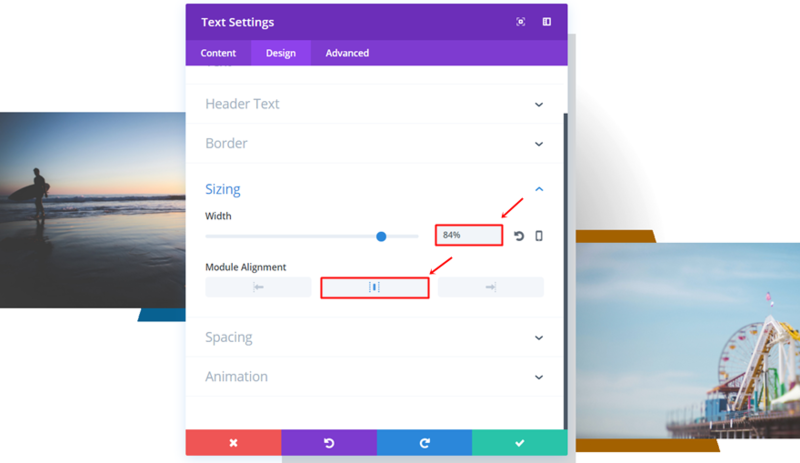 Add a new page, enable the Divi Builder and switch over to Visual Builder. 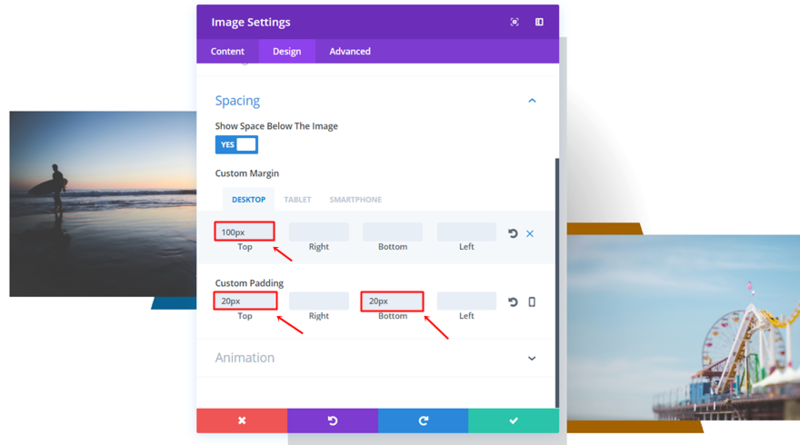 Once you’re in the Visual Builder, add a standard section. Within that standard section, we’ll be needing a three-column row. 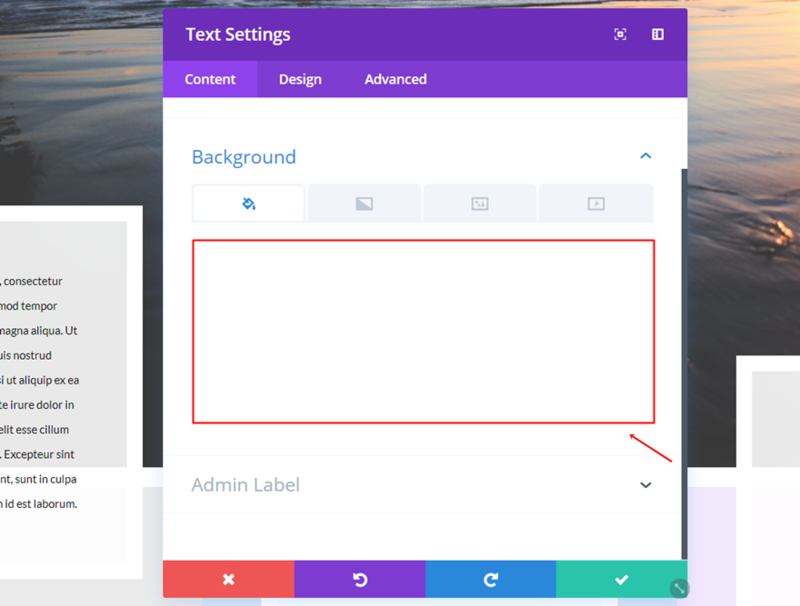 We’ll also need to set ‘#d8d8d8’ as the Column 2 Background Color. 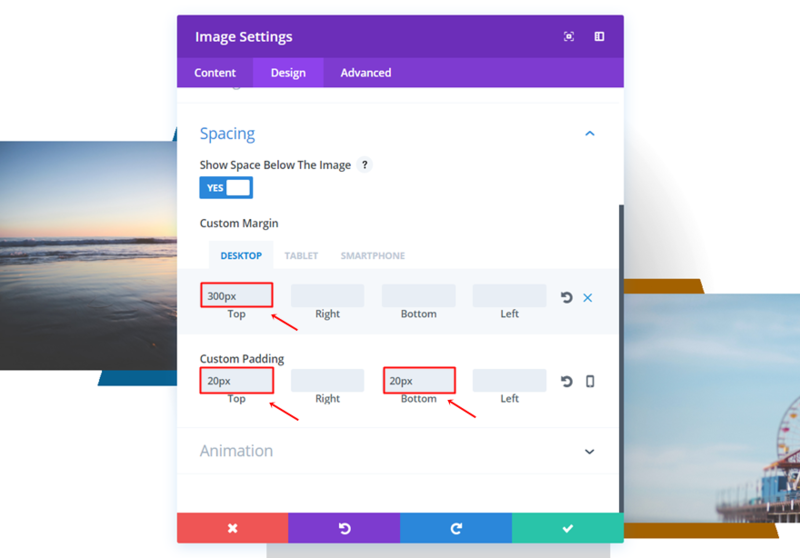 Open the Spacing subcategory and add ’50px’ to the top, right, bottom and left padding of the second column. Go to the Design tab, use the left Image Alignment and enable the ‘Always Center Image on Mobile’ option. 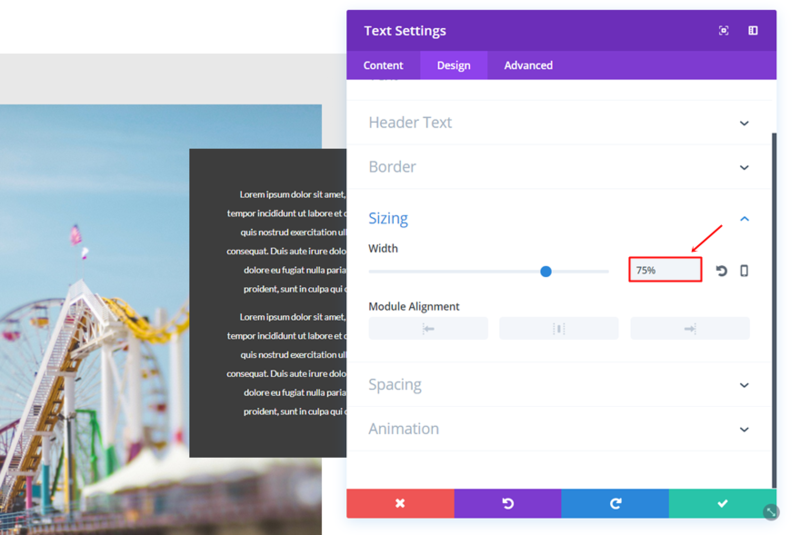 Open the Sizing subcategory, use a Width of ‘84%’ and select the center Module Alignment. 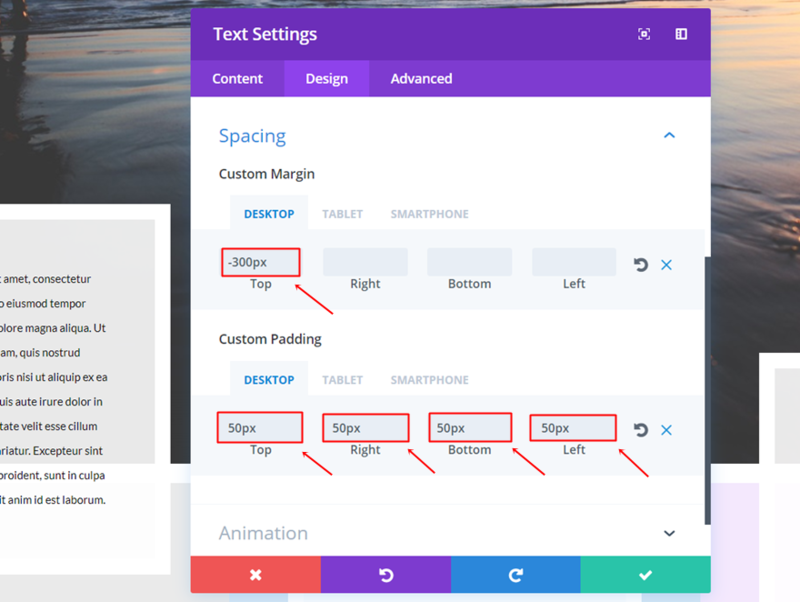 Lastly, add ’50px’ to the top and bottom margin. 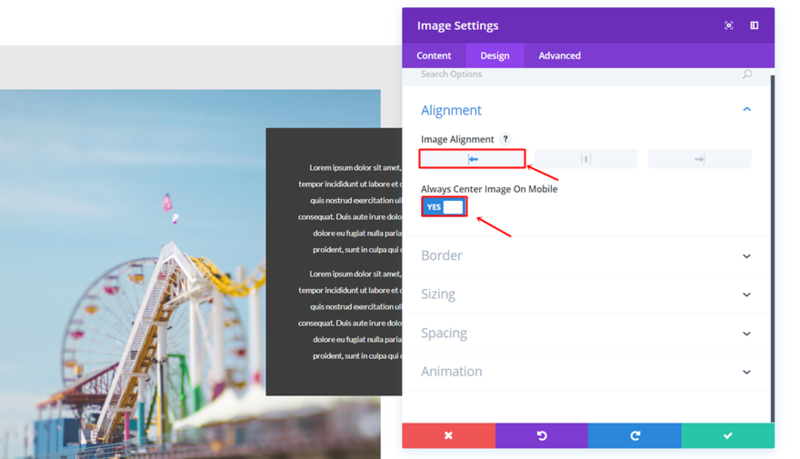 Go to the Design tab, select the left Image Alignment and enable the ‘Always Center Image on Mobile’ option. 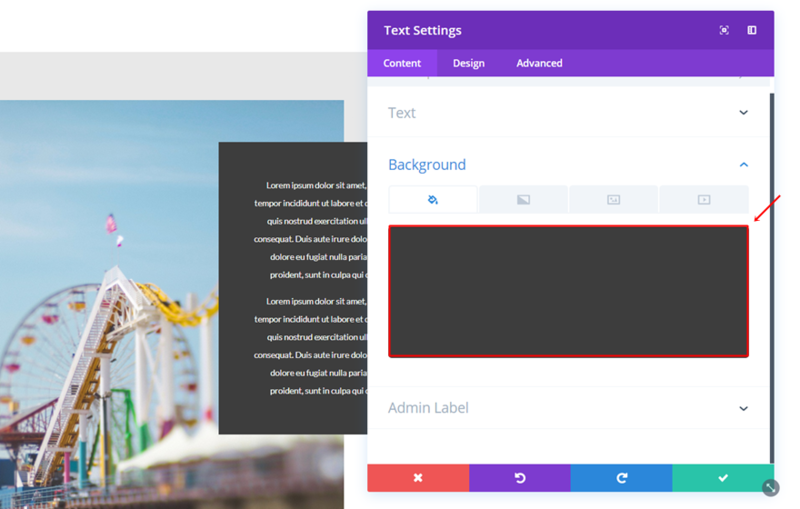 Firstly, add a new standard section. 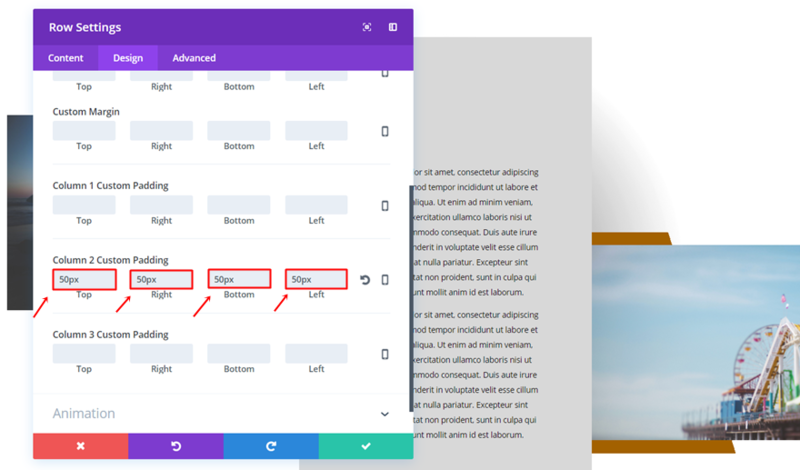 Then, add a two-column row to it. 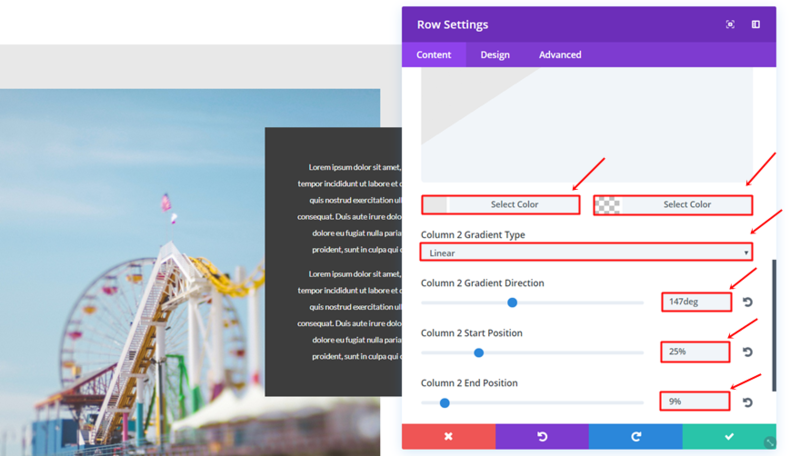 Open the row settings and add ‘#ededed’ as the Column 2 Background Color. 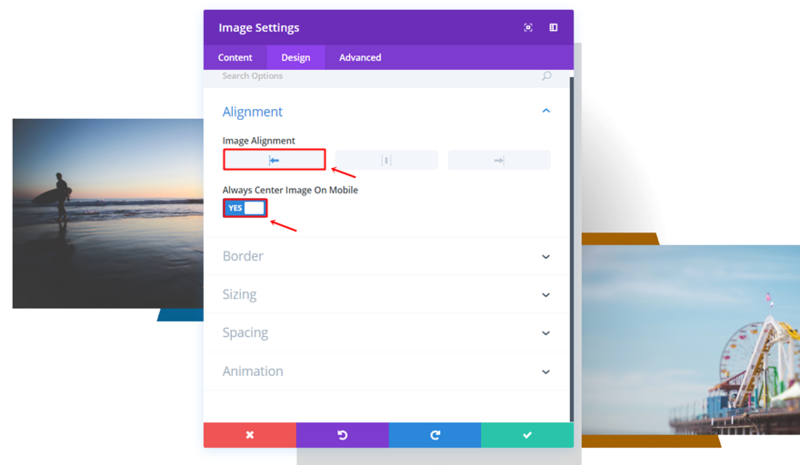 Add an Image Module to the first column, use the left Image Alignment and enable the ‘Always Center Image on Mobile’ option. Open the Sizing subcategory and apply a Width of ‘75%’. 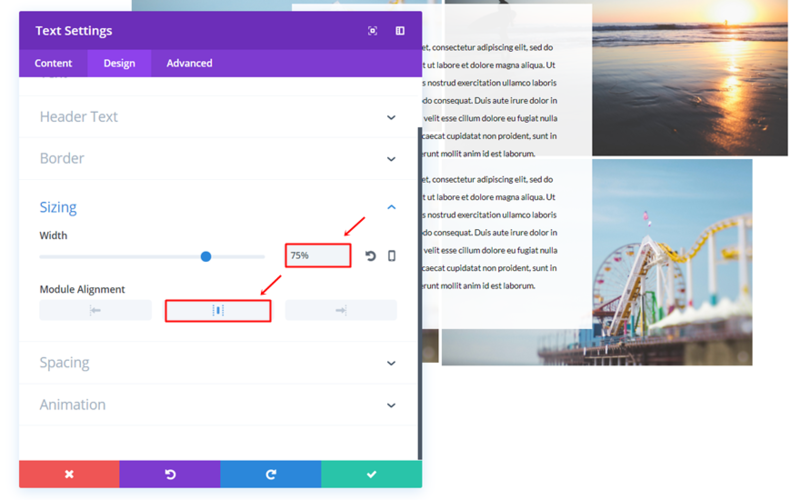 Once again, add a new standard section. 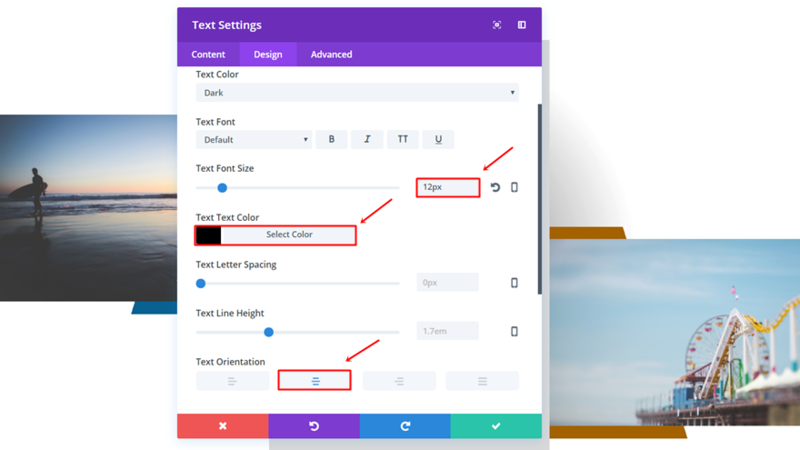 Open the row settings and use ‘#e8e8e8’ as the Column 1 Background Color. 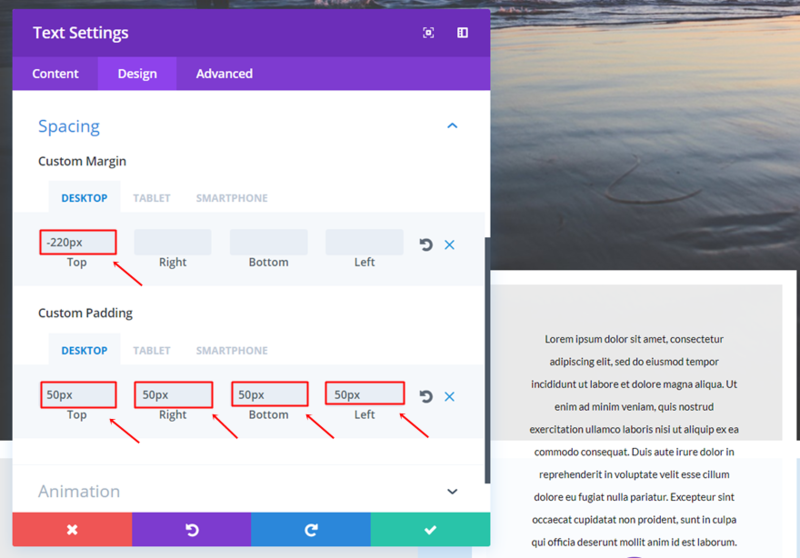 Lastly, add ’70px’ to the top and bottom padding of the first column. 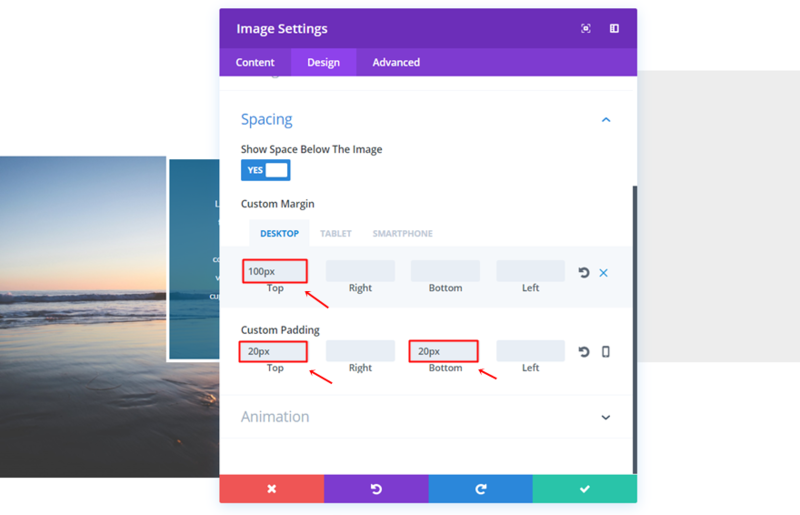 Open the Spacing subcategory and add ‘-300px’ to the left margin. 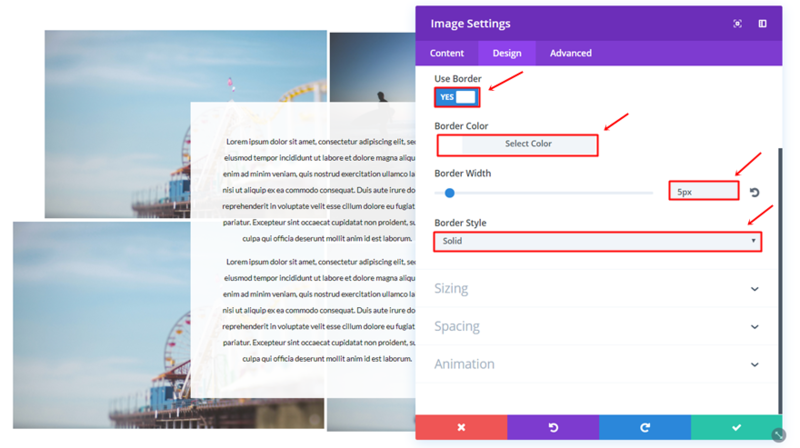 Add a Text Module to the second column and use ‘#3d3d3d’ as the background color. 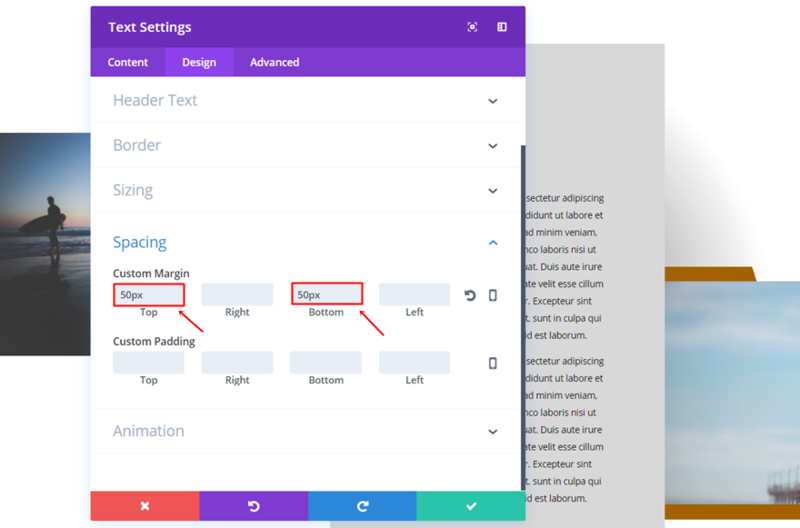 Open the Sizing subcategory and use ‘75%’ for the Width. 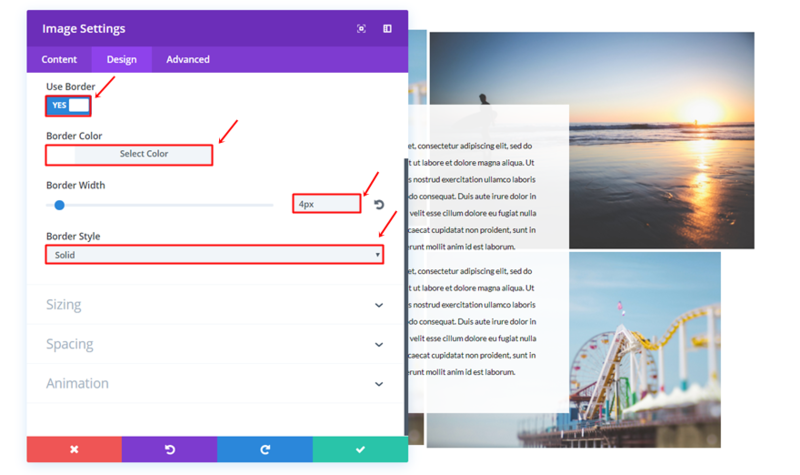 Start by adding a standard section to the page you’re working on. 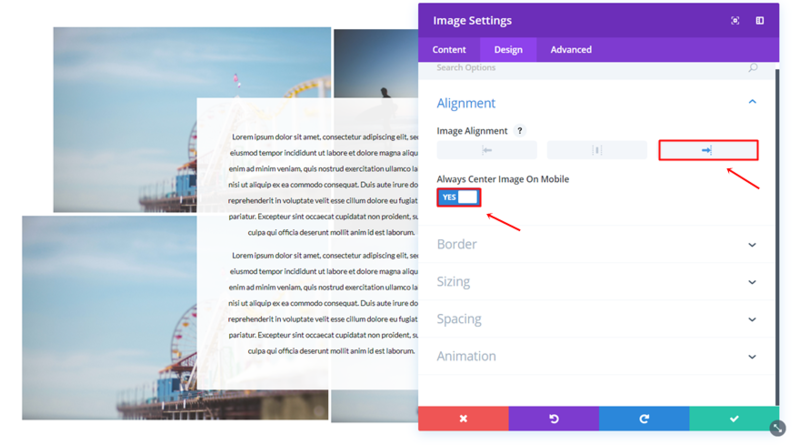 Add an Image Module to the first column, use the right Image Alignment and enable the ‘Always Center Image on Mobile’ option. 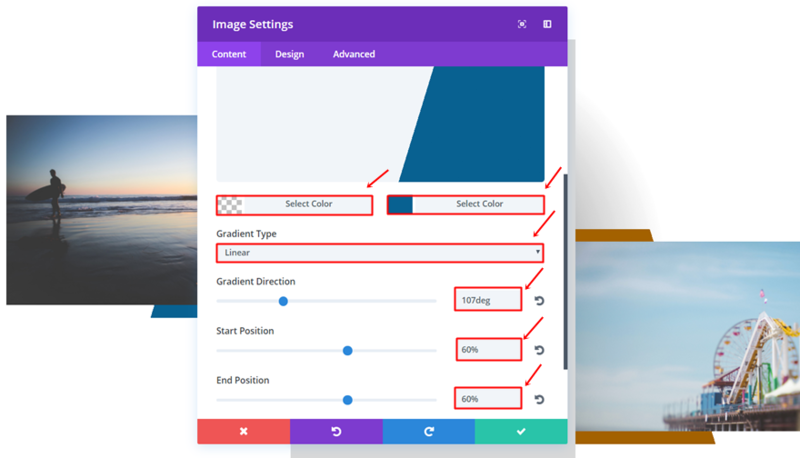 Go to the Sizing subcategory of that Image Module, use a Width of ‘89%’ and select the right Module Alignment. 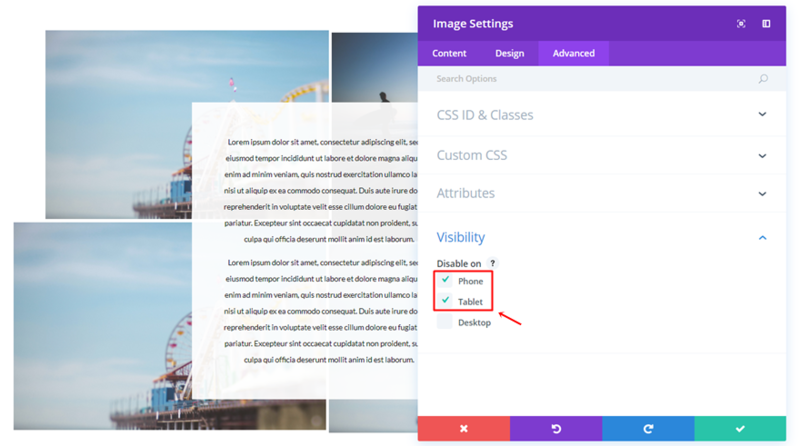 Go to the Advanced tab and disable the Image Module on phone and tablet. 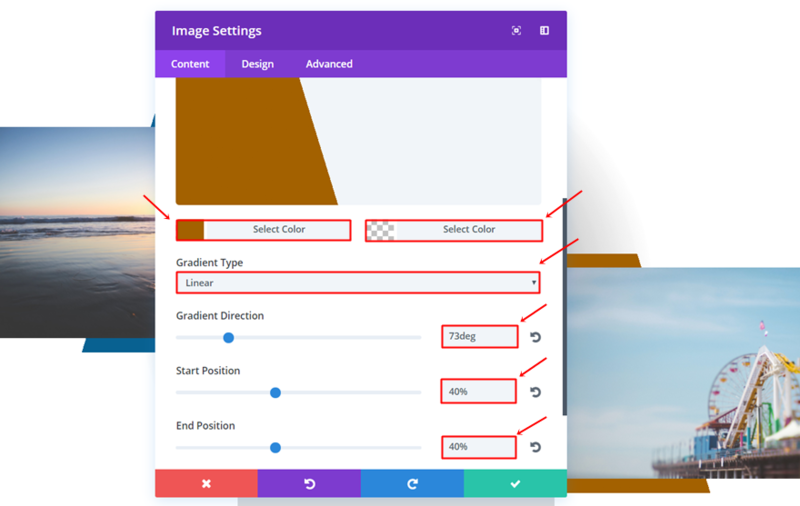 We’ll be doing this for 3 of the Image Modules that are being used. 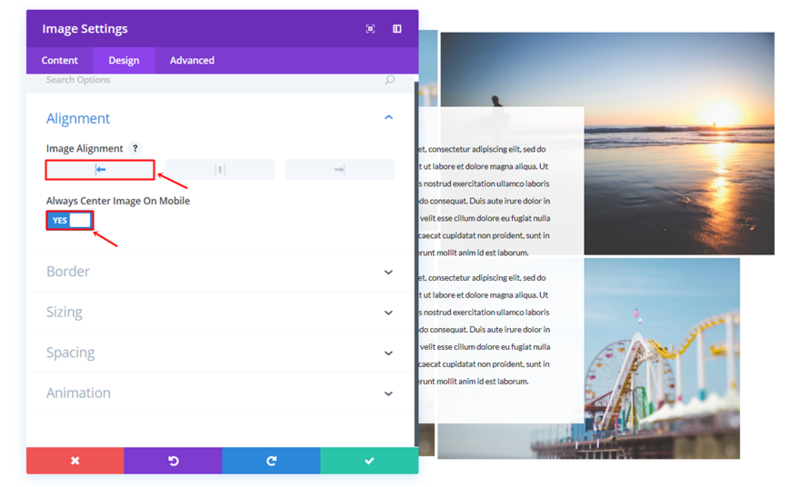 You can decide for yourself which one you want to appear on tablet and phone, in our case, that’ll be the image in the right top corner. 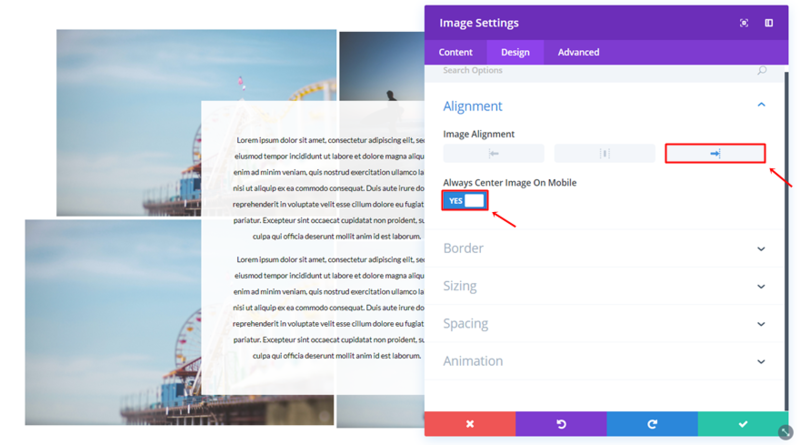 Add another Image Module, use the right Image Alignment and enable the ‘Always Center Image on Mobile’ option. 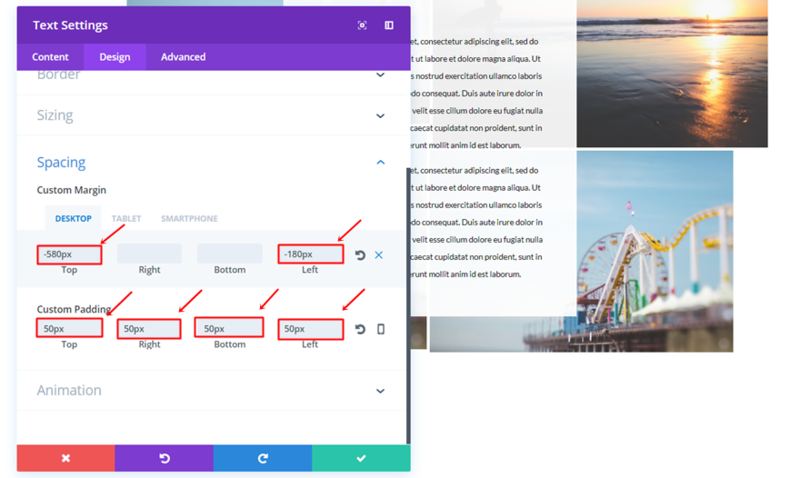 Lastly, go to the Advanced tab and disable the Image Module on phone and tablet. 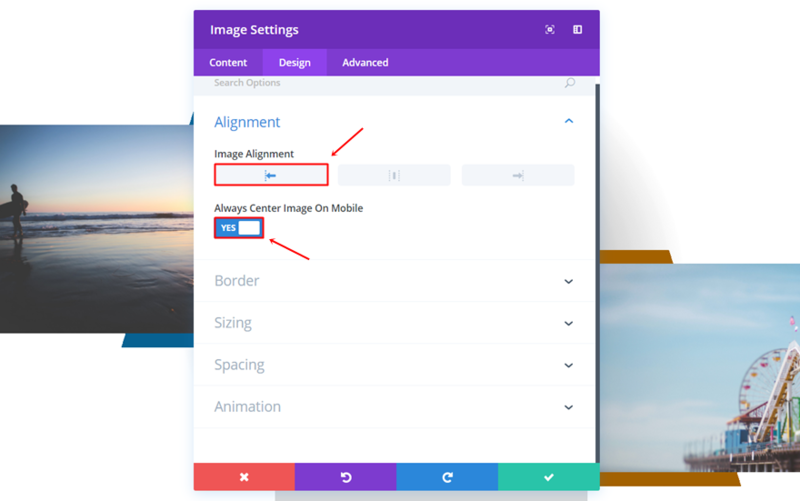 Add the next Image Module to the second column, use the left Image Alignment and enable the ‘Always Center Image on Mobile’ option. Add the last Image Module to the second column, use the left Image Alignment and enable the ‘Always Center Image on Mobile’ option. 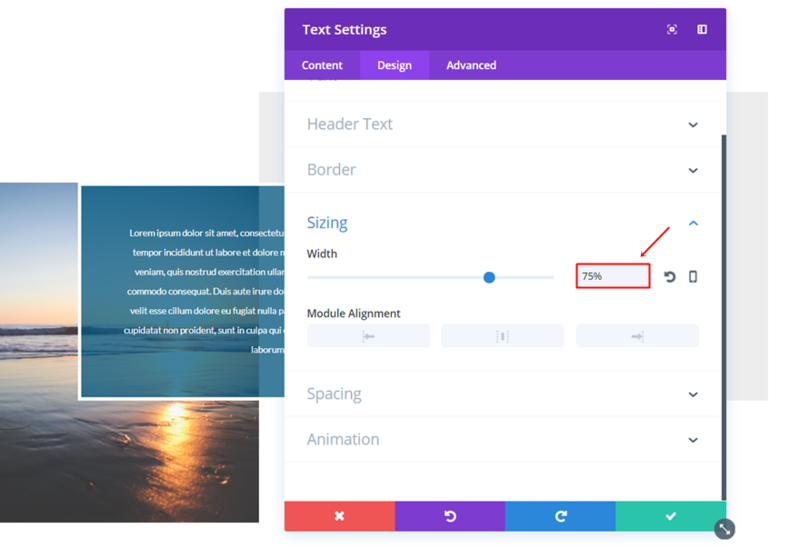 Then, open the sizing subcategory, use a Width of ‘89%’ and select the left Module Alignment. Disable this Image Module on phone and tablet as well. 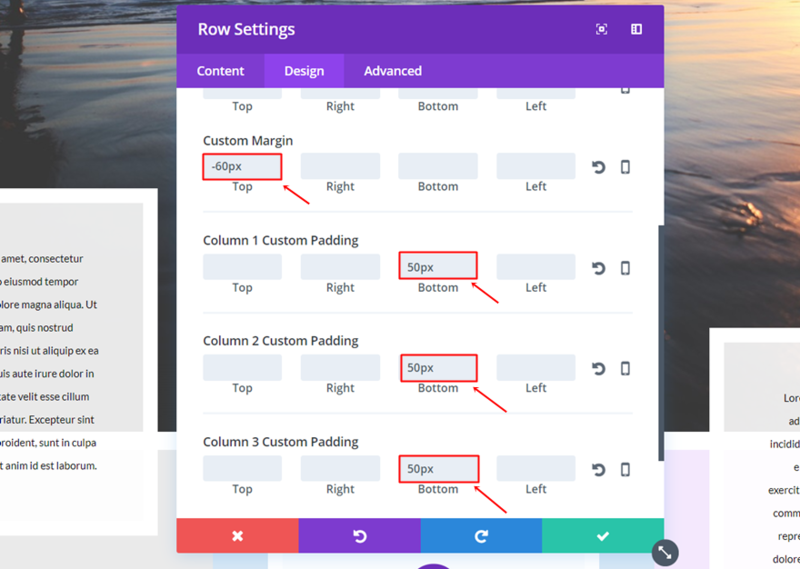 Once you’ve finished the previous row, go ahead and add another one. 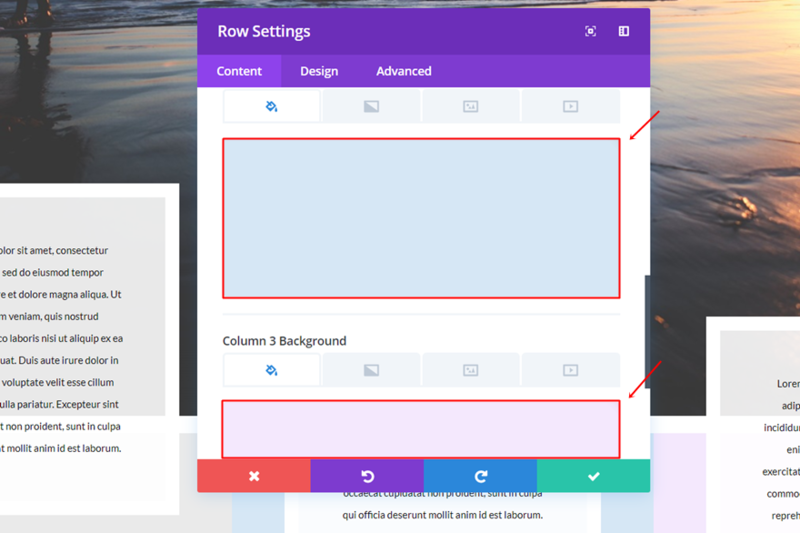 This time, the row will only need one column. 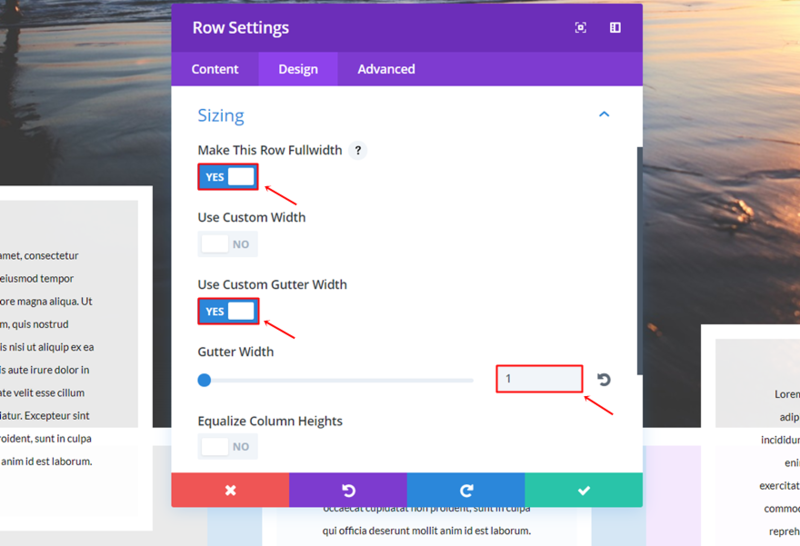 Go to the Design tab of the row settings, enable the ‘Use Custom Width’ option and use ‘581px’ as the Custom Width. 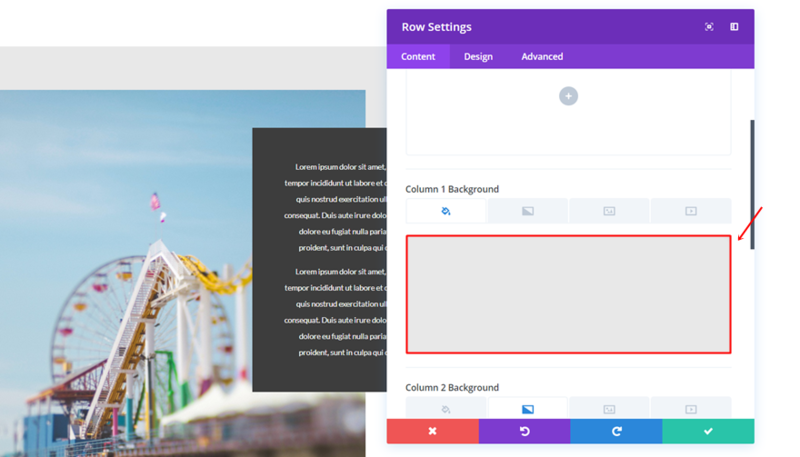 Add a Text Module to that new row and select ‘rgba(255,255,255,0.92)’ as the background color. 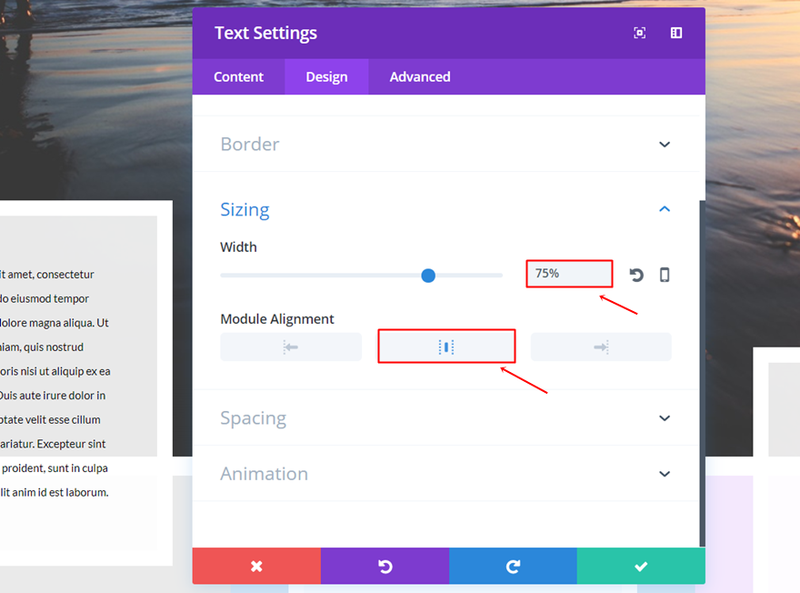 Then, open the Sizing subcategory, add ‘75%’ to the Width and select the center Module Alignment. 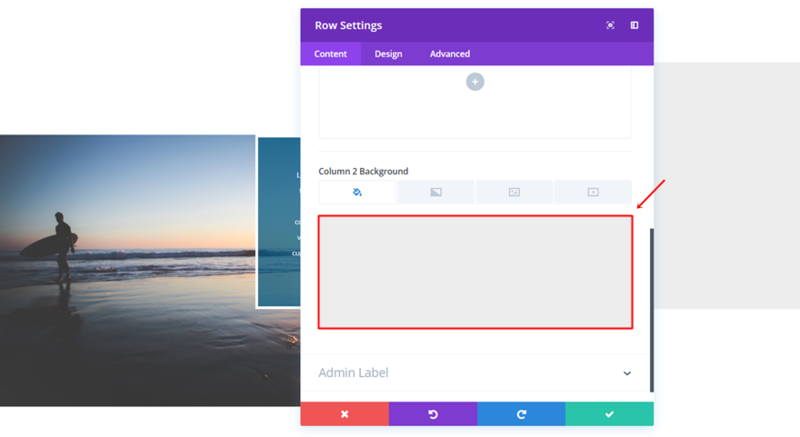 Start by adding a fullwidth section to your page. 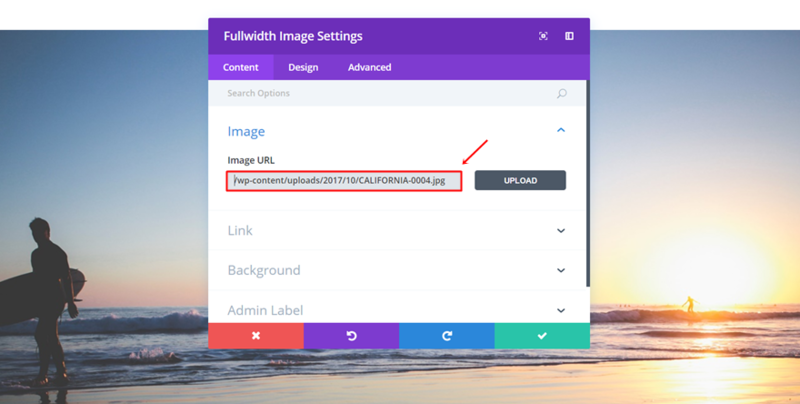 Within that Fullwidth section, add a Fullwidth Image Module. 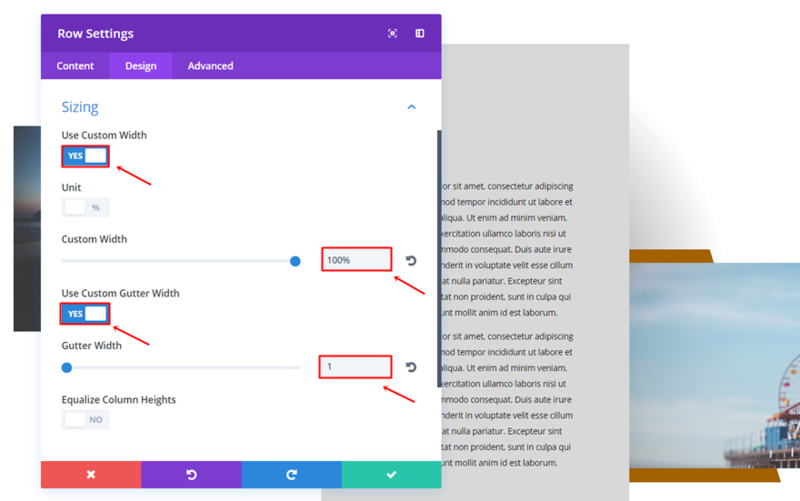 Right below the previous section, add another section. 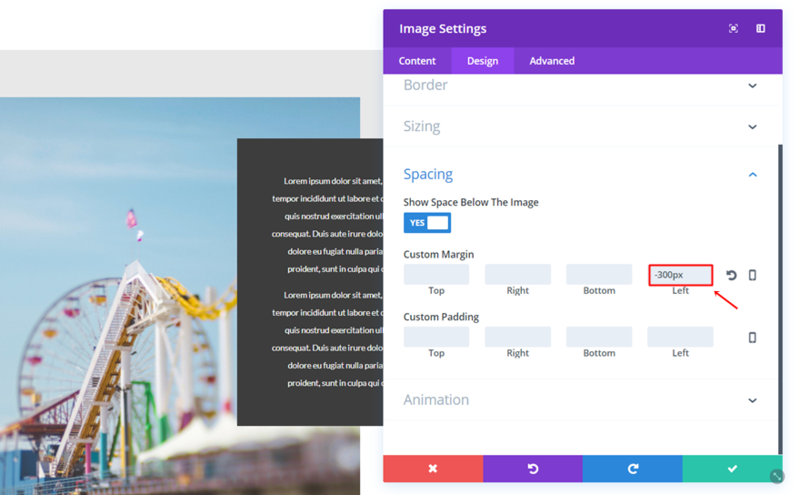 This time, the section has to be standard instead of fullwidth. 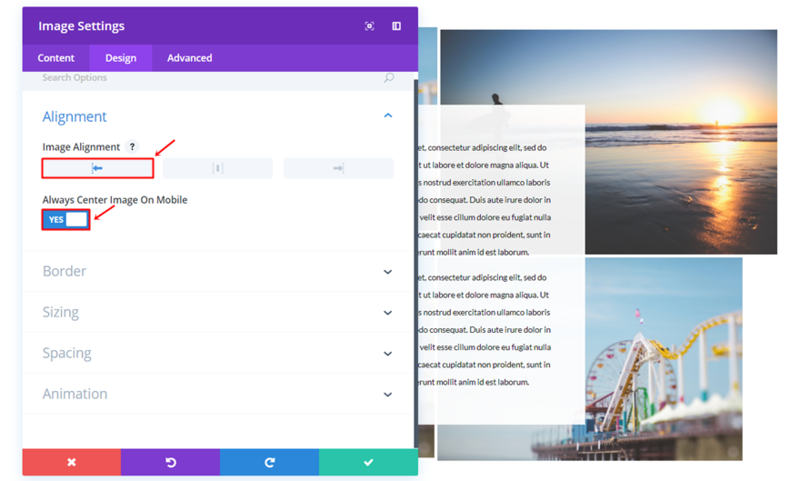 Add a three-column row to that new standard section. 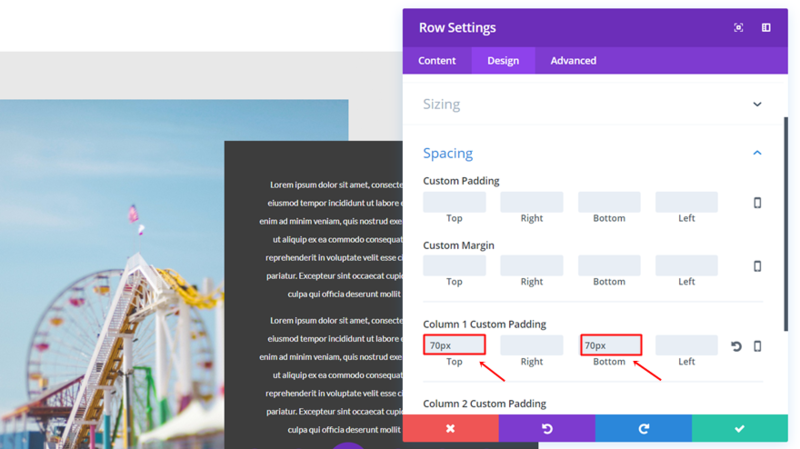 Then open the Spacing subcategory, add ‘-60px’ to the top margin and ’50px’ to the bottom padding of each column. 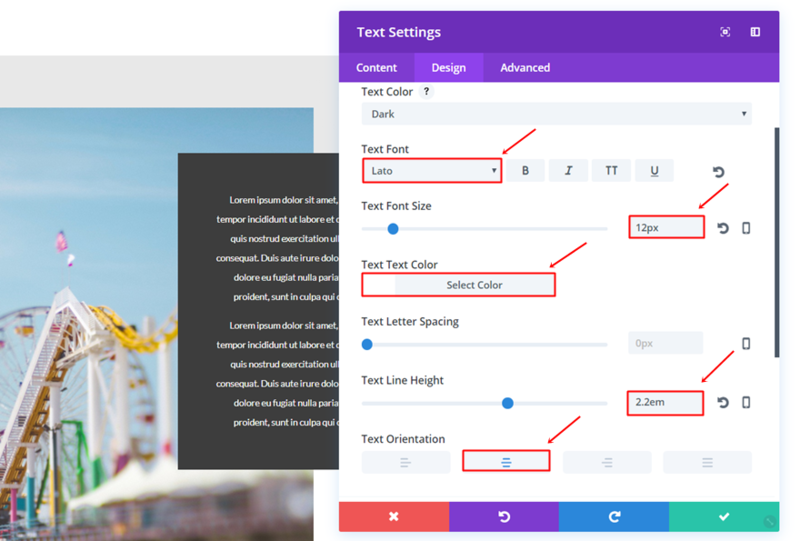 Continue by adding a Text Module to the First Column and using ‘rgba(255,255,255,0.89)’ as its background color. 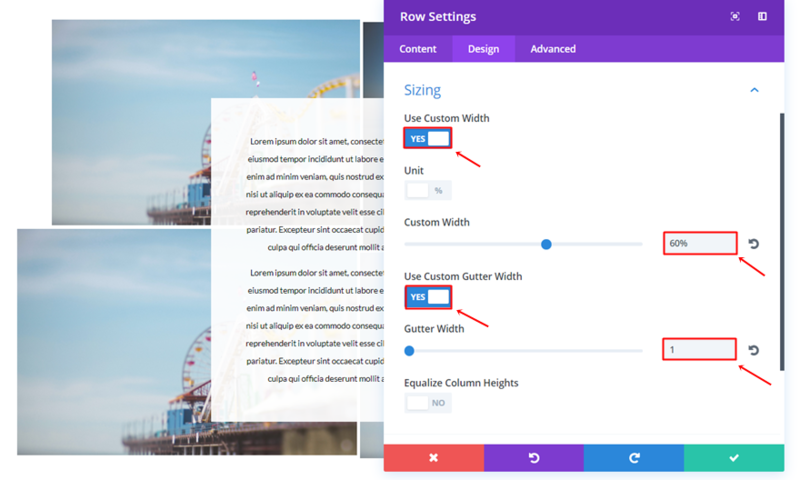 Then, use a Width of ‘75%’ and select the center Module Alignment within the Sizing subcategory. 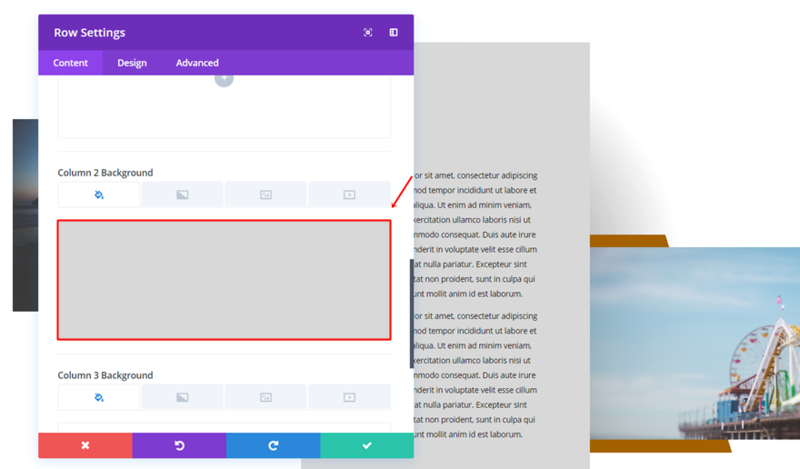 Go ahead and clone the Text Module twice. Then, place each one of the clones in the two remaining columns. 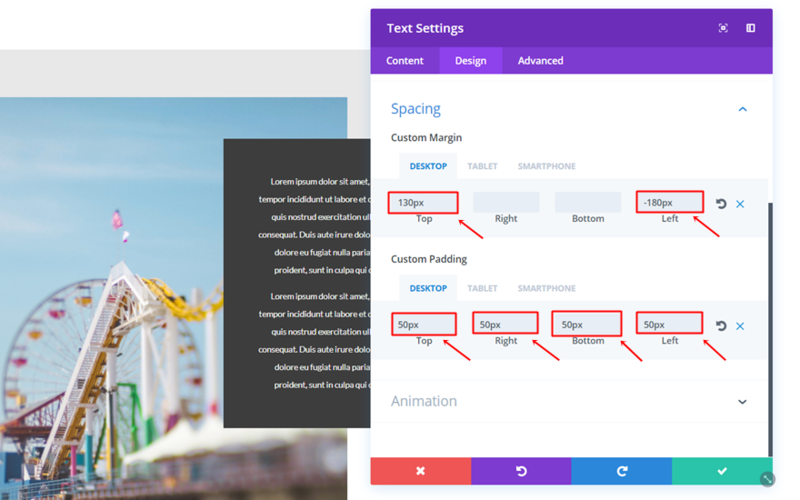 We’ll have to change the Top Margin of the Text Module placed within the second column into ‘-220px’. 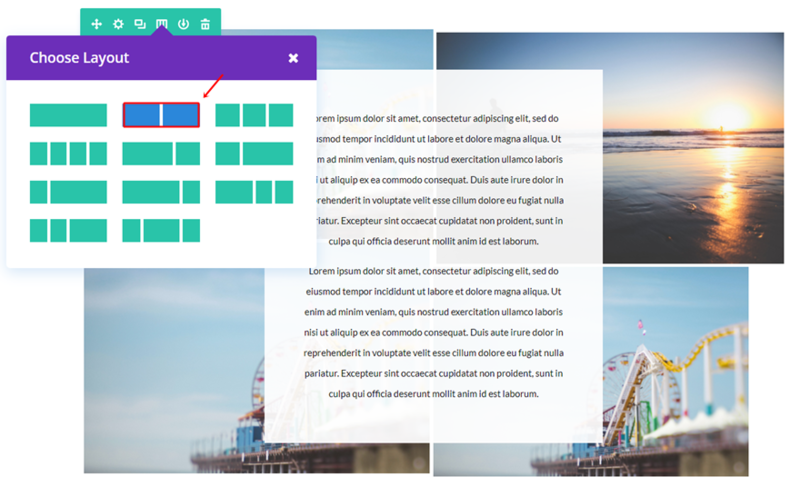 Same counts for the Text Module in the third column but the value is instead ‘-140px’. 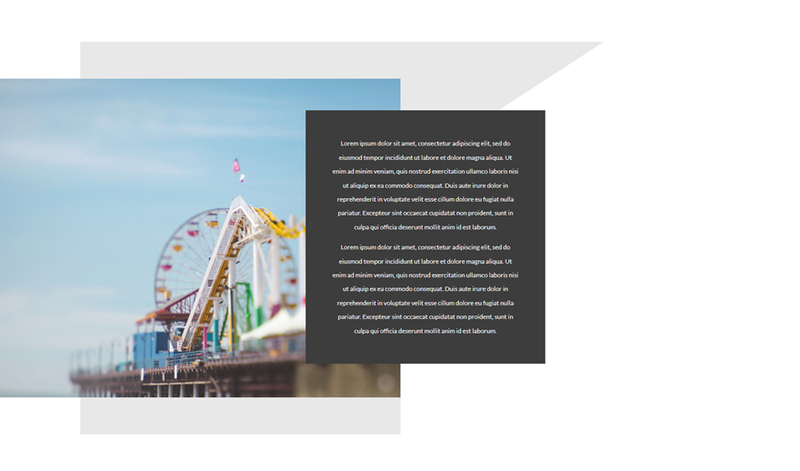 In this post, we’ve shown you some beautiful and fun editorial style section layouts that you can use throughout your own website. 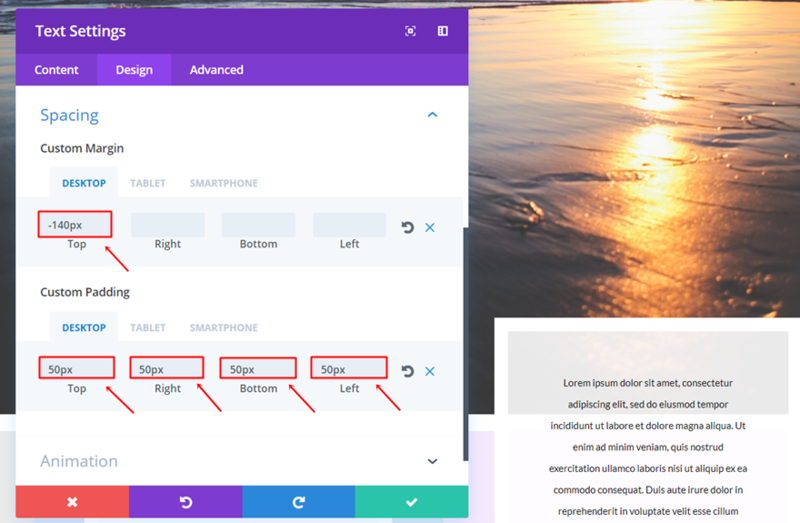 These examples show how flexible Divi’s options are and how creative you can get. If you have any questions or suggestions; make sure you leave a comment in the comment section below! This type of post is cool! 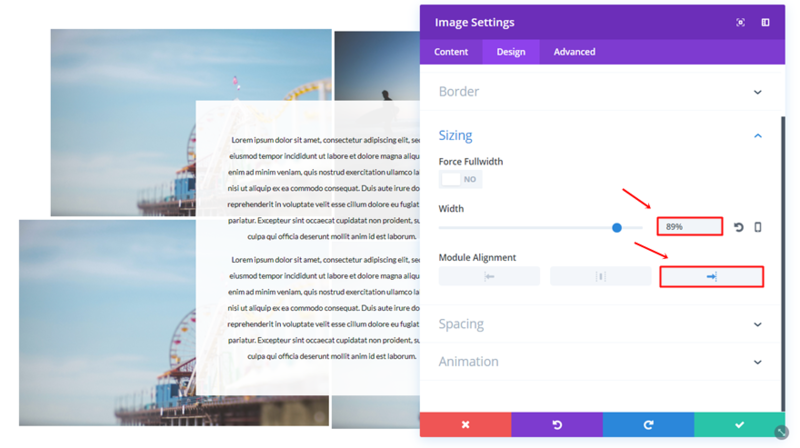 You should incorporate these designs into your future layout pack releases! No. They’re not editorial looking at all. Easy to do and really effective! 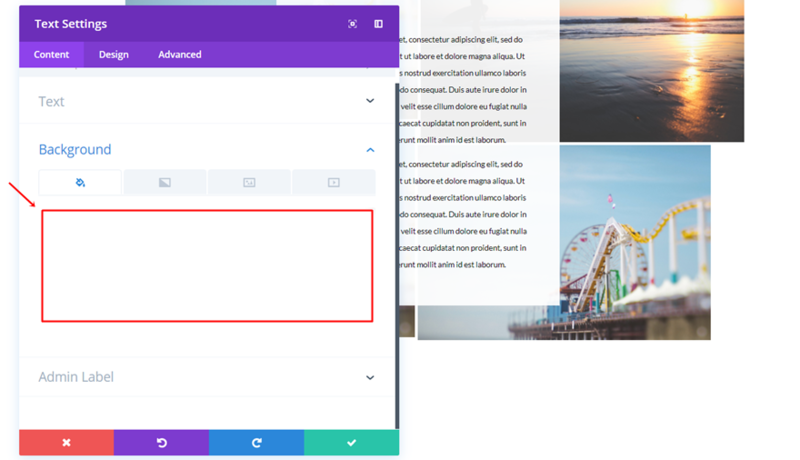 If these layouts can be incorporated as single posts, then nothing like it. 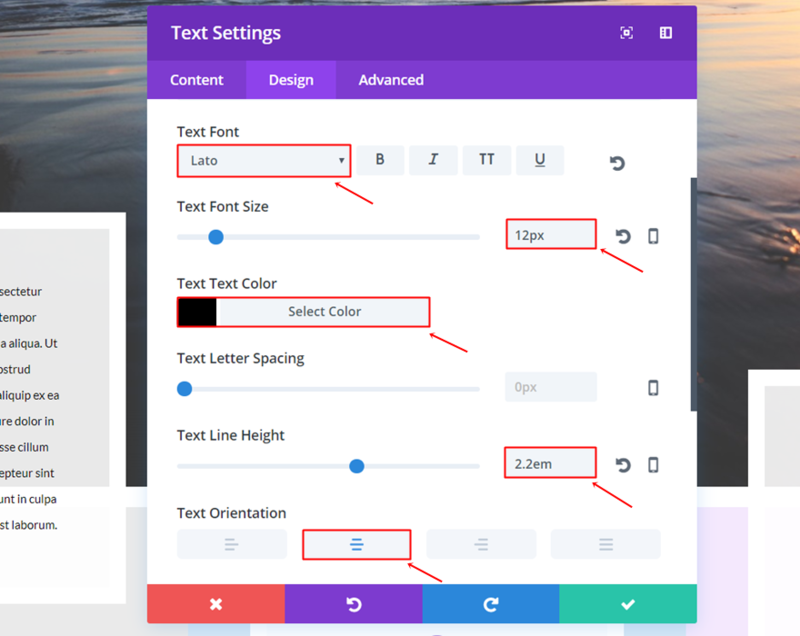 Doesn’t the text box in Example two have a white border? I don’t see that listed. 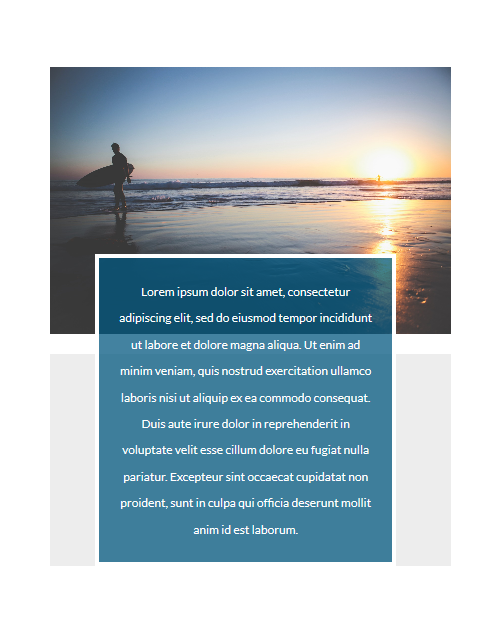 Also, with the white border, the text box INCLUDING the border is at the same horizontal height as the image on the left but because the border is white it the top edge of colored part of the text box is visually lower than top edge of the image and TO ME, that looks like a mistake. Perhaps this should have been addressed in this tutorial. 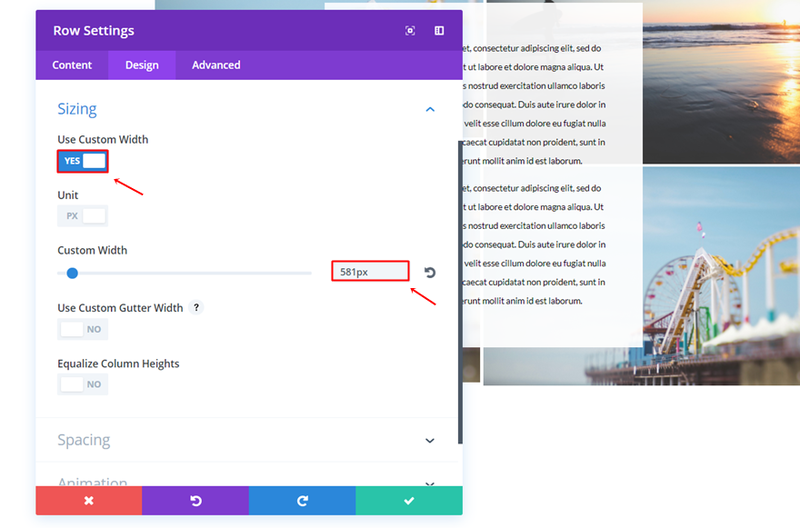 Also, I believe that I would learn more if you (and all the rest of the bloggers) would tell us/me WHY one adds the amount of padding one does to something, for example. Simply tell me what to do doesn’t teach me how to apply the concept to something else I would be doing on my own. Year ago, I watched Chef Tell on PM/EVENING Magazine cook Chicken Cordon Bleu. I have the recipe and will pull it out if I want to cook that. But I LEARNED from watching him make that recipe, that I have used for more than 30 years, is how to dice an onion quickly and easily. That’s what I’d like these tutorials to be. Not simply a step-by-step operation, but a learning process that I can use the rest of my life. Thanks for these great examples. So far I have completed the First Example with no problems. These look beautiful. 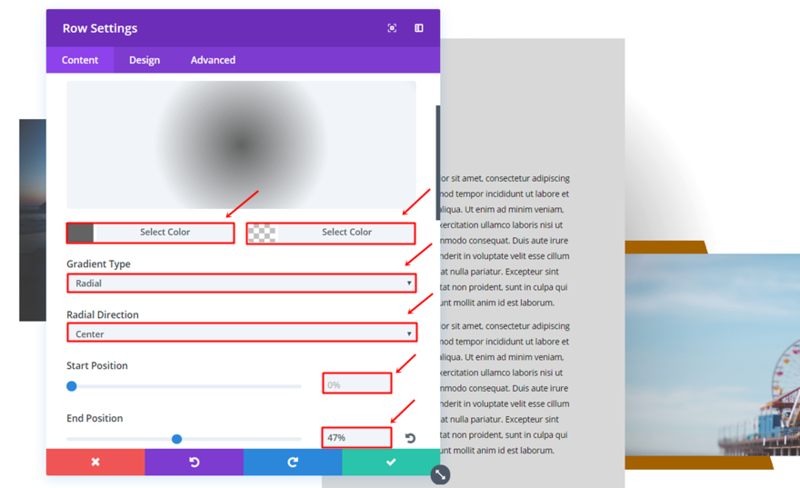 It never crossed my mind that these designs can be done with Divi visual builder. Especially that diagonal shape design. Need to experiment more with the builder. 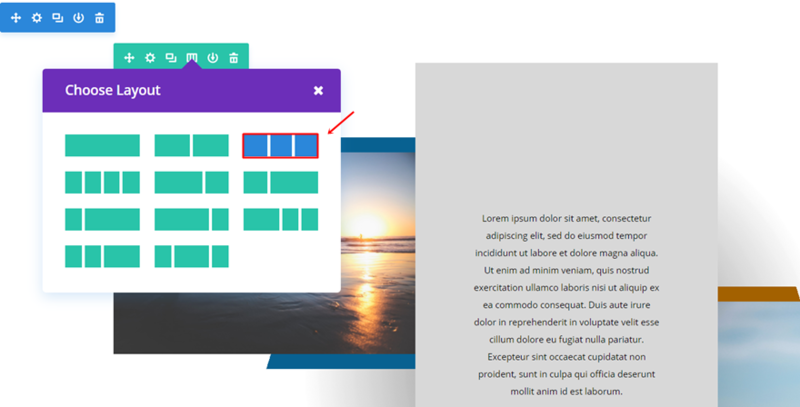 Hi, how do I add text above the fourth example section? 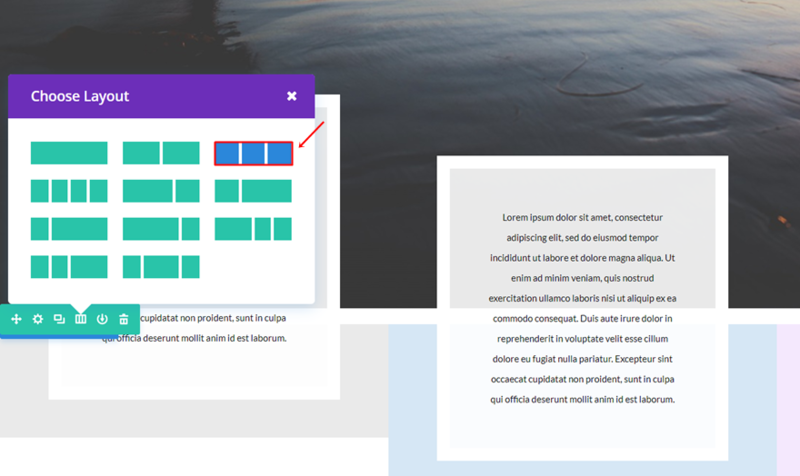 I have it working fin, until adding a section above which breaks the layout of the text module.